A former male student expelled a week before graduation last year for sexually assaulting a female student is now suing the University of Chicago and the female student. In attempts to substantiate the male former student’s case, the lawsuit shows information sourced from UChicago’s confidential Title IX investigation into the sexual assault case. Disclosure of this kind of information could prompt legal action from UChicago. The lawsuit, filed in early November, argues that UChicago discriminated against the plaintiff on the basis of gender and denied him a fair investigation. It also sues the female student, who brought the case of sexual assault to the school, claiming she spread false information about him and intended to inflict emotional distress on him. This is the second lawsuit in recent years that sues UChicago under Title IX for discriminating against males. The first one, filed in 2016 by a male student facing a sexual assault complaint at the time, was settled in early 2018. It’s the latest of numerous lawsuits nationwide in which a male college student has sued his school after being suspended or expelled for committing sexual misconduct. The suits also often sue the female student who brought the case to the school administration. The wave of lawsuits comes at a point of high tension between activists in support of sexual abuse survivors and opponents of Title IX reforms that add more protections for survivors. As nationwide movements for survivors have grown larger, the Department of Education (ED) under Secretary of Education Betsy DeVos—appointed by President Donald J. Trump—has in effect energized the movements’ opponents, through attempts to bolster the legal privileges of college students accused of sexual misconduct. Representatives of the defendants, the University and the female student, declined requests for comment, citing the pending status of the lawsuit. Last spring, UChicago expelled the plaintiff after the Student Disciplinary Committee found that he verbally and physically abused the female student—his former girlfriend—during their relationship and sexually assaulted her after their relationship ended. UChicago rarely expels students found responsible for sexual misconduct, which suggests that the Committee found evidence against him that was stronger than in most cases. 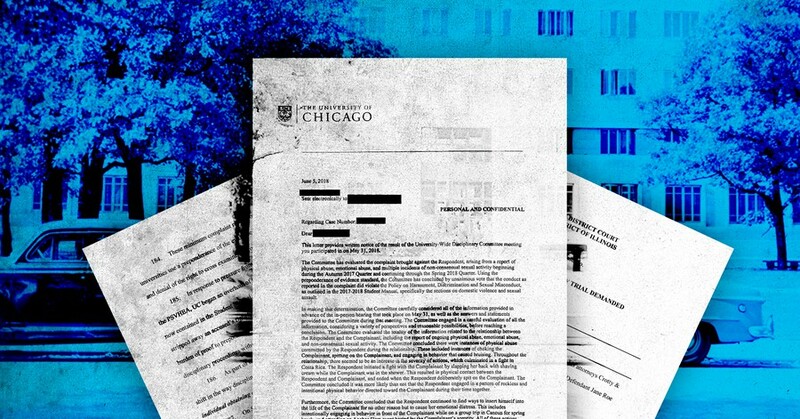 The plaintiff’s lawsuit, in attempts to disprove the claim of sexual assault, shows select pieces of oral testimony from the female student and from witnesses that it says are from UChicago's Title IX investigation file. It also shows text messages between the female student and her friend that are likely from the investigation file. The lawsuit uses these to try to show that the female student had never engaged in non-consensual sexual activity with the plaintiff. For example, the lawsuit cites testimony from some witnesses that saw the female student the night she said the sexual assault occurred. In one instance, it quotes a witness’s claim that the female student “was not incapacitated,” in an attempt to refute the female student’s testimony that she was too intoxicated to give consent that night. The witness testimonies were not attached as exhibits of the main lawsuit, and so The Maroon could not confirm the context surrounding the quoted statements. The plaintiff was allowed to view the highly confidential investigation file during the investigation and was not allowed to view or access it after the investigation. This suggests he took a record of the testimonies and text messages when viewing them during the investigation or accessed the file at some point through covert means. The plaintiff’s lawyer declined to confirm how the plaintiff obtained the pieces of information. “Unnecessary or indiscreet disclosures may be viewed as retaliatory and may constitute grounds for University disciplinary action or...a lawsuit,” it goes on to state. Because the plaintiff was expelled, he may have felt that he had nothing to lose by violating UChicago’s confidentiality policies. The University declined to confirm whether the plaintiff did violate University policies and declined to comment whether the University could and would pursue legal action against the plaintiff if he did violate University policies, again referring to the lawsuit’s pending status. If the plaintiff did violate UChicago’s policy by publishing the oral testimony and text messages, the information isn’t necessarily barred from consideration in court. Christine Evans, the legal director of Chicago Alliance Against Sexual Exploitation (CAASE), told The Maroon that “it would be up to the judge to determine if a violation of a university confidentiality policy or using underhanded means to obtain evidence is enough to make [the information] inadmissible.” She said the University could bring attention to the confidentiality violation, if it occurred, by raising an objection in court. CAASE is a nonprofit organization that provides legal services for survivors of sexual harm and advocates for policy reform. Evans added that, in general, “Judges tend to scrutinize admissibility of documents like text messages.” This is because the male student’s lawyers would have to prove that the messages are actually from the people they purport they are from and that the messages are accurate representations of people’s words. The lawsuit argues that the Student Disciplinary Committee was biased against the plaintiff due to his gender. It faults the Committee for only considering testimony in favor of the female student, and for using a preponderance of the evidence—more than 50 percent likely—standard of proof instructed by the Obama administration instead of following instructions made by the Trump administration. In 2011, the Obama administration sent out the “Dear Colleague” letter, a set of recommendations for addressing sexual assault, to colleges across the country. Illinois adopted many of the recommendations, including the preponderance of the evidence standard, in its 2015 Preventing Sexual Violence in Higher Education Act (PSVHEA), which UChicago is mandated to follow. In 2017, the ED under the Trump administration rescinded the “Dear Colleague” letter and published a new set of recommendations that said that schools have the option of raising the standard of proof to a clear and convincing standard. Illinois has not amended PSVHEA in accordance with the new recommendations, and UChicago has not changed its policies either. The ED under the Trump administration has so far found UChicago’s Title IX policy to be in compliance with federal standards. The ED has closed all four Title IX investigations into UChicago that were open or have opened since Trump came into office. The investigations were prompted by complaints that UChicago did not fulfill its obligations to look into claims of sexual misconduct. The male student’s lawsuit also argues that the Committee conducted an unfair investigation, violating UChicago’s student manual and the male student’s “right to basic fairness”—in particular, by denying him the opportunity to have legal representation, to call witnesses, and to cross-examine the female student during the disciplinary hearing. These three legal privileges are by law only required to be granted to parties in a criminal court case. As a private institution conducting an internal investigation and hearing, UChicago was not required by law to grant either student these legal privileges. UChicago’s student manual states that both the student who brings forward a case of sexual misconduct and the accused student are “entitled to bring a person of their choice to the proceedings, whose role is limited to providing support, not acting as an advocate, participant, or witness.” This person can be a lawyer, but the lawyer will not be able to speak for the students during the hearing. The students are also not allowed to call witnesses during the hearing. Under PSVHEA, students are not allowed to cross-examine each other. The intention is to protect survivors of sexual misconduct who may find the experience traumatic. However, students may submit questions to University members investigating the case, who can choose to ask the questions during the hearing. The ED revealed new regulations two week ago that give schools the option of allowing students to cross-examine each other through advisers in a live hearing. These regulations, unlike the recommendations published previously, are meant to become federal law. The Federal Register published the regulations on Thursday, and they now face a 60-day public comment period before being finalized. Lawsuits nationwide have used similar arguments to sue schools. A lawsuit filed in early 2017 by a Purdue University student suspended for sexual assault also claims that Purdue was biased in following Obama-era guidelines and denying him the opportunity to cross-examine the female student. Evans, the legal director of CAASE, said she’s seen this type of lawsuit arise more frequently in recent years. She said the lawsuits appear to be part of a backlash against nationwide movements in support of survivors of sexual assault, such as the #MeToo movement. Most recently, many advocates of survivors have rallied behind Christine Blasey Ford when she claimed, during Supreme Court Justice Brett Kavanaugh’s nomination process, that he sexually assaulted her decades ago. “Any time survivors step up and say, ‘We’re here and you should listen to us,’ there is at least an equal if not a much greater backlash,” Evans said. She added that efforts by the ED to repeal Obama-era guidelines have seemed to “embolden” the male students who bring forward these lawsuits and the lawyers who represent them, because the ED is reinforcing their arguments that Obama-era guidelines are not fair to students accused of sexual misconduct. The male students and their lawyers “can point to [the Trump-era guidance] and say, ‘If the Obama-era guidance was so appropriate, then why are we rolling it back now?’” Evans said. The case has been assigned to judge Virginia M. Kendall. The initial hearing has been scheduled for January 25, 2019, in which the parties will discuss whether they want to settle or proceed with a trial. The parties may also choose to settle before the initial hearing.